Your thyroid is a small gland with big responsibilities. As part of your endocrine system, it produces hormones that travel through your bloodstream to every cell in your body. Thyroid hormones control many of your body functions, including your heartbeat and metabolism. Hypothyroidism is the medical term for a sluggish or underactive thyroid. More common in females, it is estimated that 1 in 8 women have thyroid issues. 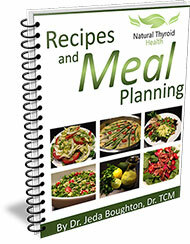 Thyroid imbalance is more likely to occur during menopause and pregnancy due to significant hormone changes. In most cases, hypothyroidism is caused by your thyroid underperforming by failing to produce enough thyroid hormone. Sometimes, however, it is caused by a dysfunction in the conversion of the storage hormone T4 to the active hormone T3. Hypothyroidism slows down your metabolism, causing you to gain weight. In fact, unexpected weight gain is often the first sign that women notice when they have a sluggish thyroid. If you continue to gain weight despite a healthy diet and exercise, your thyroid may be to blame. In general, your doctor should test your thyroid function if you experience fatigue, hair loss, depression or unexplained weight gain. Because hypothyroidism is common in older women, doctors sometimes recommend screenings with a routine blood test during annual health exams. Your thyroid is often screened during pregnancy as well. Diagnosis is most often based on a blood test that measures your thyroid-stimulating hormone (TSH), a hormone produced by your pituitary gland. Since the TSH has become the gold standard for thyroid testing, doctors often disregard how you’re feeling. However, lab testing should be used as a guide and the emphasis should be put on your signs and symptoms. Listen to your body instead of trusting a lab results. Your body will signal a need for help with some of the signs and symptoms listed above. If your doctor ignores the signs, shop around for a practitioner in Vancouver that has more experience treating patients with thyroid disease. Through proper nutrition, nutrient supplementation and taking a holistic approach to health and wellness, you can support your thyroid naturally. Not only can this improve your thyroid function, but also enhance your general health and wellbeing.